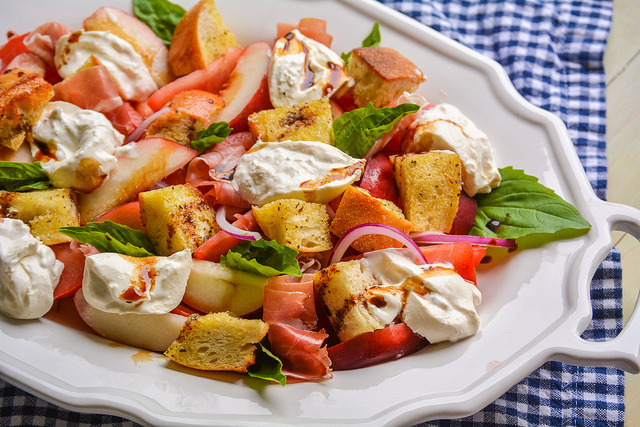 A Taste of Tuscany in this seasonal summer bread salad. The creamy burrata, aromatic basil, ripe tomatoes, and salty prosciutto are the perfect pairing with summer seasonal peaches. I love using everything that is in peak season during the summer. Tomatoes and peaches are just two of the produce items that are currently overflowing at the local farm stands. I have been incorporating them in just about every meal possible lately and today’s recipe is one of the winning combinations that have come from my experimentation. 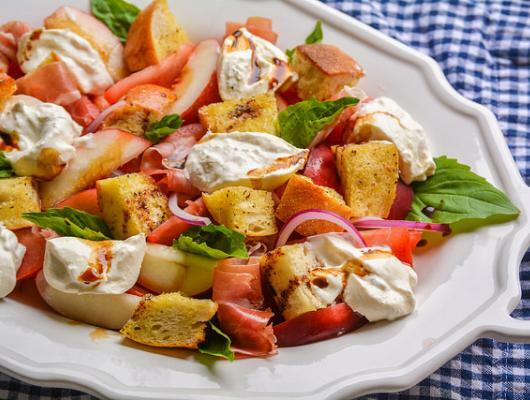 For those of you who are not familiar with Panzanella salad, it is a Tusacan style bread salad. It also almost always incorporates tomatoes, so it is an ideal summer dish. I took some creative liberties with the traditional Italian salad and added some burrata, peaches and prosciutto. If Panzanella wasn’t already a delicious dish, these ingredients make it just downright mouthwatering. I eat this salad as a meal but, it certainly will find the perfect place on those barbecue picnic tables, on your Sunday supper menus, or at the next brunch gathering.